The exploration of Mars is not like your parents' science fiction adventure movie, where would-be explorers hit the ground with wheels spinning, flinging up red rooster tails of dust as they motocross their way over the Martian terrain in search of a game-changing plot complication. Not like that at all -- well, except for the part about the game-changing plot complication, which is the entire thrust of the mission of NASA's Curiosity rover. The game-changer--assessing if conditions on Mars were ever suitable for the formation of life--is in fact a much desired complication, something we've been hoping to determine since we started studying Mars with robotic probes almost 50 years ago. As far as an action adventure goes, Curiosity's activities since landing on Mars ten months ago might be called conservative. It's traveled less than half a mile from its landing spot and poked about the rocks and soil in one small area, while what we might assume is the beginning of its true adventure lies five miles and maybe a year or more away. 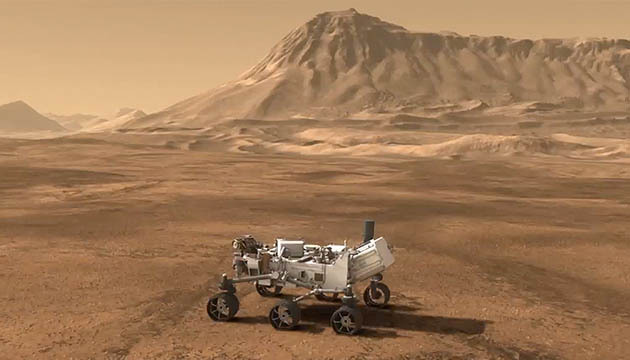 Curiosity's primary mission is to study the geology of the layers of sediment that make up Mount Sharp, a large mountain at the center of the vast Gale Crater. Gale is an ancient impact crater believed to have filled with sediment over billions of years of erosion and deposition, some of it probably by water action. Like an open book of the geologic history of Mars, its story written in pages of sediment, Curiosity has yet to climb up its slopes to read the conditions of the past. While I am as anxious as the next Mars geek to see the gravel and stone of Mount Sharp up close (and, I admit, my own sense of the fantastic yearns for Curiosity to find something like, oh, say, fossils), it's worth mentioning that Curiosity's work at its "base camp” (an area of crater floor alluvium dubbed "Glenelg”) has proven to be a huge down payment on that game-changer we're looking for. Three different types of geology converge in this area, which has given Curiosity a variety to sample sources to drill, scoop, and analyze. Early in its exploration Curiosity discovered a pebbly matrix that strongly resembles formations on Earth that are known to have been laid down by past streams of water, hinting at liquid water flowing over the Martian terrain long ago. Using its drill, Curiosity has probed deeper into Martian geology than ever in the past—2.6 inches—revealing beneath the weathered, rusty orange outer surface of its target rocks ("John Klein” and "Cumberland”) the blue-gray face of a hidden Mars. Analysis of the John Klein rock samples revealed a number of chemical elements found in life on Earth, including sulfur, nitrogen, hydrogen, oxygen, phosphorous, and carbon. Past surface water. The chemicals that comprise Earth-life. Game-changing findings. Not bad for what amount to warm-up exercises at the foot of a mountain that promises to tell us so much more about Mars' past. Now, Curiosity is preparing to shift gears and enter a long-distance travel mode to reach the foot of Mount Sharp in the coming months. Mission scientists can't say when it will reach the mountain, because there is always the possibility that Curiosity will happen upon something so interesting that we must stop to take a closer look, but that's how exploration goes: often it is along the journey, and not what we find at the destination, that we discover the biggest game-changers.